This begs to ask the question: what or who is an influencer or thought-leader? Who decides? What makes some thought-leaders more powerful than others? How do we classify them? 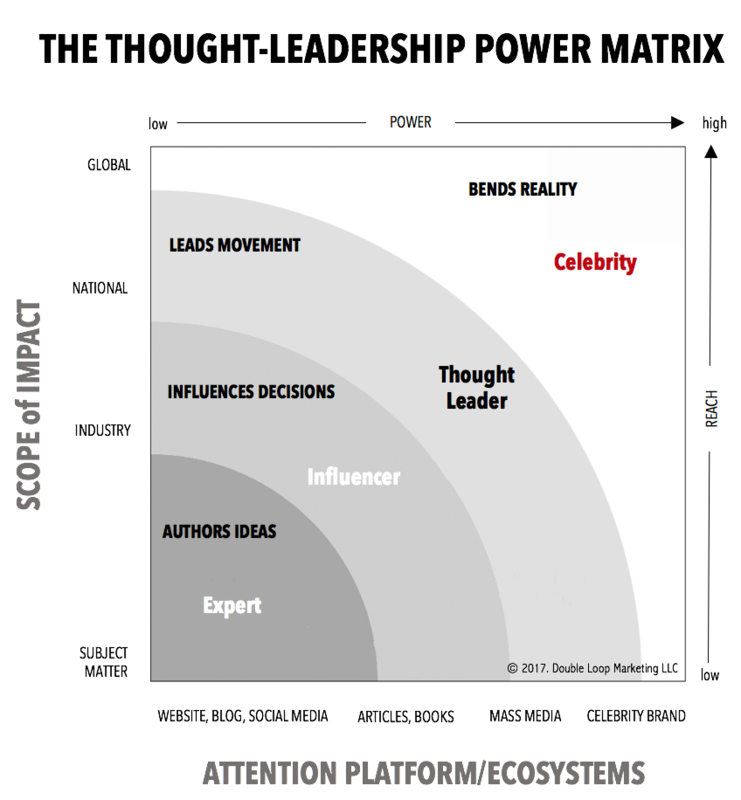 The thought-leadership power matrix is an attempt to classify the various levels and types of idea-makers, along with the scope of their impact and the vehicles they use to gain attention. Expert: someone who demonstrates their knowledge on a specific topic, creating new insights in their domain of expertise. This is the “subject-matter expert” who often writes blog posts, is active on social media, and is regarded as an authority in the work place. Influencer: the expert who has written a book (or several) and regularly publishes their views in industry journals and magazines. They may be consultants and advisors to the decision-making process both within and external to the organization they work for. They have a niche following of loyal fans. Thought-Leader: the influencer who is viewed as a “guru” by the industry and the public. They are often invited to speak at conferences, on television and public events. They may or may not be a household name – depending on their area of expertise – but they are viewed as the pre-eminent thinkers in their domain. They have a national and international following, and may sometimes lead a “movement” to change or improve a workplace or social issue. Celebrity: the icon or popular “star” who is adored or hated by the public. Celebrities include sports and movie stars, rock stars, flashy CEOs and even political figures. Their appeal is often emotional and rarely based on intellectual achievements. The entertainment and reality-show “halo-effect” is real and should not be dismissed lightly. The danger with celebrity brands and their sponsors is the risk of reputation implosion – where well known celebrities misbehave in public, hurting both themselves and their associated brands. Let’s understand that there is a considerable difference in the level of attention generated by celebrities who endorse consumer-facing brands and public thought-leaders focused on technical, intellectual and policy matters. They simply play in different ecosystems. For example, Donald Trump‘s celebrity status (now significantly enhanced by his new job) commands a global audience. Every tweet of the President has the potential to help or hurt businesses, start a trade war, and disrupt the world order. This is the ultimate power of extreme celebrity: their words can shape and bend reality. We can contrast President Trump’s influence with a thought-leader like Seth Godin, one of our favorite marketing thinkers. Granted, Seth is not going to start a war with a tweet, but his benign influence is deeply felt with his loyal audience. 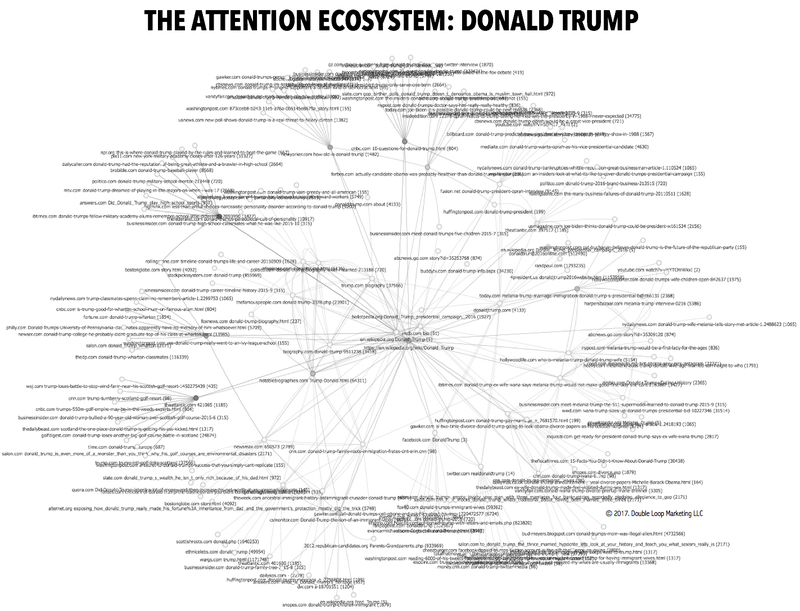 Both Trump and Godin command attention, and it is this landscape of attention that we choose to call the attention ecosystem. What vehicles does an idea-maker use to spread their ideas? Where and how are ideas disseminated? 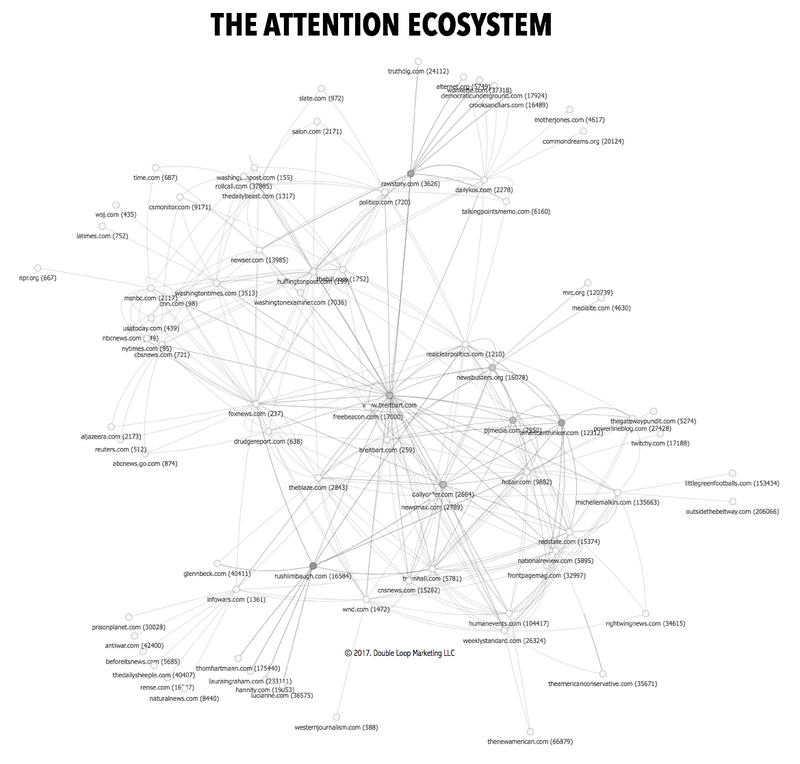 What is the most effective platform for a thought-leader? The Internet has disrupted traditional media outlets, and changed the news ecosystem forever. President Trump’s assertion that CNN is “fake news” is a challenge to the established order. New sites like Breitbart.com command more attention than the Wall Street Journal. The chart below shows the fragmentation and gaps between the traditional media and newer online sites that are disrupting the status quo. Ironically, Breitbart.com offers politicians like Newt Gingrich a platform to denounce reporters, and call them propagandists. Note that thought-leaders and celebrities don’t need the media; the media needs them. As long as a celebrity goes directly to their attentive followers, there is no need to “play nice” with the press. This is the publicity model followed by President Trump, and one can argue that it is also what the more successful companies do – they engage directly with their fans. 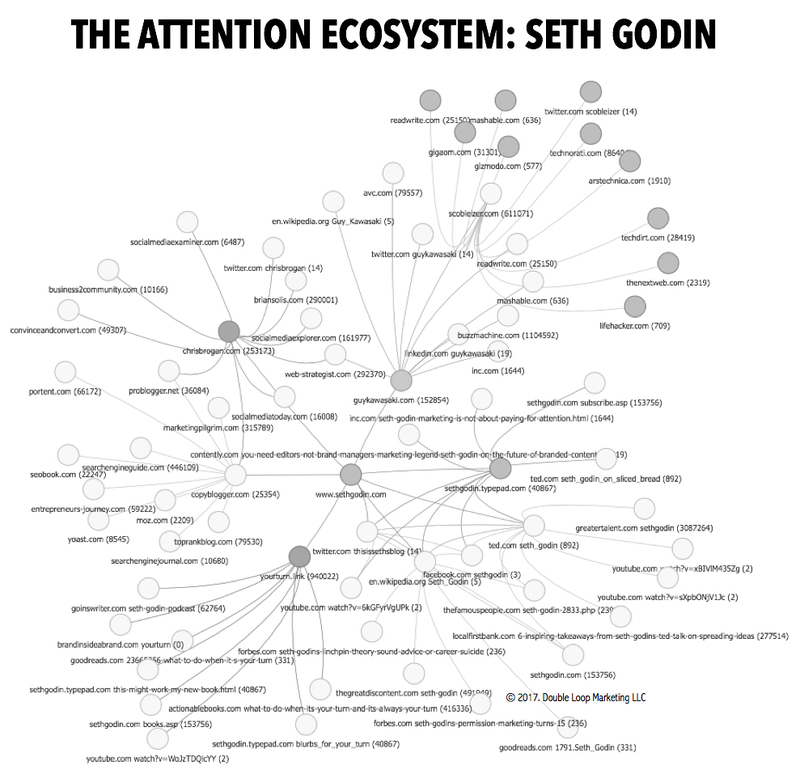 Seth Godin‘s attention ecosystem (shown below) is a network that allows him to quickly spread his ideas to people who follow him. You’ll recognize some of the other online marketing thought-leaders in Godin’s ecosystem – people like Robert Scoble, Chris Brogan and Guy Kawasaki. This is why businesses must pay attention to the attention markets. What message are they sending to their customers? Their prospective customers? Society at large? It is not a coincidence that the CEOs of so many companies are also celebrities in their own right. If your company’s CEO is a thought-leader, you have a better chance of being heard. Peter Drucker said something to the effect that the charismatic CEO is not always the most effective CEO, but that was before Trump. What is your company doing to establish itself as a thought-leader?